This week in class we have been discussing parables and allegories. After moving through the extensive extended metaphor presented by Golding in Lord of the Flies, I moved my students to 19th century America and the classic works of Nathaniel Hawthorne. We mainly focused on my favourite of his works, the parable entitled “The Minister’s Black Veil” which is a wonderful story discussing human nature and the ways in which we hide from each other. Once again, as I discussed in the last post, the goal of these little teacher’s corner articles is to open up dialogue about great literature and to help us #savetheculture that seems to be dying. As with most of Hawthorne’s work, “The Minister’s Black Veil” takes place in a small Puritan village in 17th century America. The story begins as the community funnels into their local church and waits from their pastor to emerge from his home. As he does, there is something noticeable about his appearance—over his face is a black veil which hangs to just above his lips. 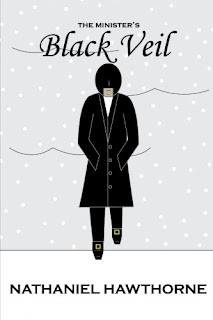 The rest of the short story details how this small piece of black crepe separates the pastor from the world and how many were so affected by the appearance of the veil that they shuddered and fled from his presence. As he grew older, he became a widely respected and celebrated pastor but his veil remained where it first was placed. It is said that he never removed the veil, even when alone, and that he was eventually buried with the fabric still covering his face. Love, brotherhood, and even death could not remove the veil which, as he aged, had made him such a powerful and important religious leader. 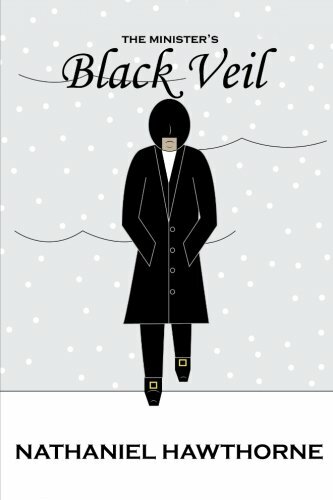 When discussing this story, it is first of note to mention that this is based on the true story of Joseph Moody of York, Maine, a clergyman who was involved in the death of a friend and wore a black veil until he died. Next, the context of this story is of great importance. The puritans were a group of people whose soul focus (ha, pun) was God and salvation. While they did believe in predestination, they worked tirelessly in God’s service and so sin, morality, and judgement were all driving factors in their everyday lives. Knowing this gives us an insight into the meaning of the work and the parable Hawthorne has crafted. Father Hooper, the veiled protagonist, refuses to remove the veil from his face for any reason, and even as his congregation, the children of the town, and his fiancée drift away from him, his resolve never falters. What then, is the symbolic meaning of the veil? In the world of puritan New England, there was no grey area in regards to sinning. Also, if we look at ourselves as humans, we know that everyone sins and that many of us keep ours hidden away, either out of fear or embarrassment. IN the story, we see many people stare at the veil and eventually become not only repulsed but terrified by what it implies. Hawthorne has created a story that showcases the hidden lives and sin of everyone by creating a character who wears a physical representation of that sin on the outside. By showing everyone his own demons, others who see him are reminded of their own and that proves to be a powerful preaching tool. Father Hooper wears a black veil to hide his face from others and himself. People wear a mask/fake face/façade to hide their sin from others and from God. With that, we can see the message of morality that Hawthorne has constructed. In writing this story, he draws attention to the fact that everyone has secrets but we must acknowledge those and work through/past them if we ever want to grow as individuals. That is the human question present in Hawthorne’s “The Minster’s Black Veil.” Secret sin consumes all of us and to work through these issues, we must make them known not only to ourselves but to those around us—it is the only way to truly grow.